1. "In comparing a leech to the embryo at the alaqah stage, we find similarity between the two." "Also, the embryo as this stage obtains nourishment from the blood of the mother, similar to the leech which feeds on the blood of others." 2. The second meaning of the word alaqah is 'suspended thing'. 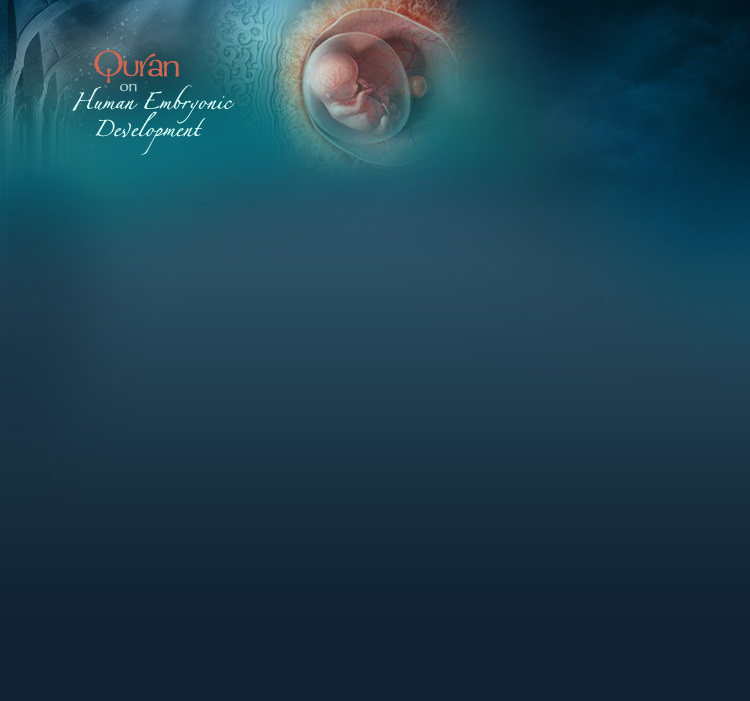 The suspension of the embryo, during the alaqah stage, in the womb of the mother very appropriately fits this description. 3. The third meaning of the word alaqah is 'blood clot'. We find that the external appearance of the embryo and its sacs during the alaqah stage is similar to that of a blood clot. This is due to the presence of relatively large amounts of blood present in the embryo during this stage. Also during this stage the blood in the embryo does not circulate until the end of the third week. So the embryo at this stage is like a clot of blood. Professor Keith Moore is one of the world's prominent scientists in the fields of anatomy and embryology and is the author of the book entitled the "Developing Human", which has been translated into eight languages. This book is considered a scientific reference work and was chosen by a special committee in the United States as the best book authored by on person. Dr. Keith Moore is a Professor of Anatomy and Cell Biology at the University of Toronto, Toronto, Canada. In 1984, he received the most distinguished award presented in the field of anatomy in Canada, the J.C.B. Grant Award from the Canadian Association of Anatomists. He has directed many international associations, such as the Canadian and American Association of Anatomists and the Council of the Union of Biological Sciences. In 1981, during the Seventh Medical Conference in Dammam, Saudi Arabia, Professor Moore said; "It has been a great pleasure for me to help clarify statements in the Quran about human development. It is clear to me that these statements must have come to Muhammad from God, or Allah, because almost all of this knowledge was not discovered until many centuries later. This proves to me that Muhammad must have been the messenger of God, or Allah [The reference for this statement is on 'This is the Truth' (video tape). For a copy of this video tape please contact us]. Consequently, Professor Moore was asked the following question, "Does this mean that you believe that the Quran is the Word of God?" He replied; "I find no difficulty in accepting this."